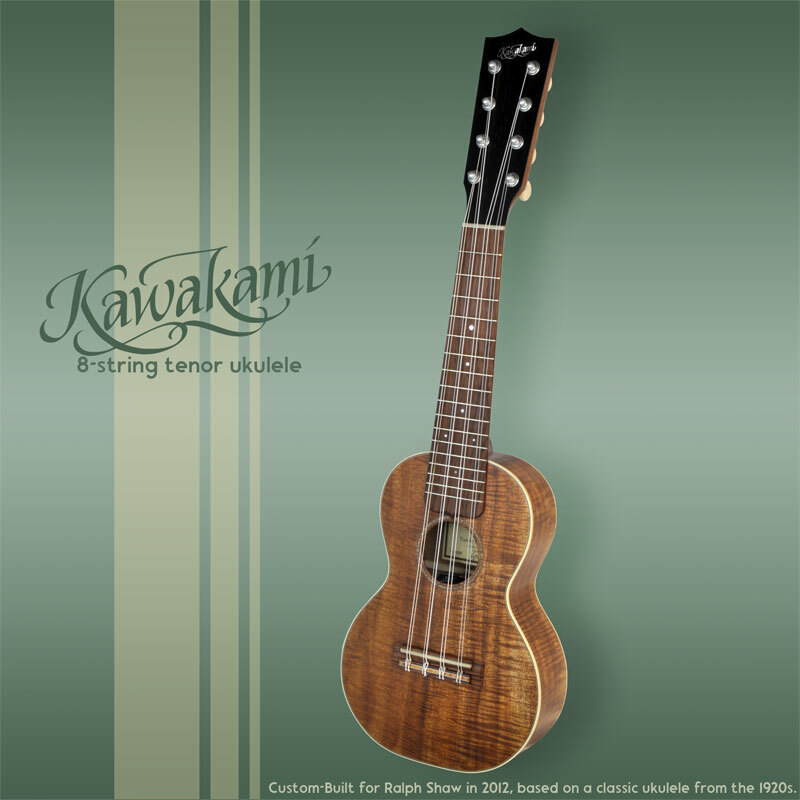 Some time in 2008 the "King of the Ukulele" (Ralph Shaw) walked into Yusuke Kawakami's luthier workshop with a bruised and battered old Martin Taropatch ukulele in the hopes that it could be nursed back to life. It couldn't. But the instrument itself was still inspirational for a craftsman like Yusuke and so he offered to build a replica for just a minimal fee and the chance to study an instrument built with such obvious passion. The first question was how exact a replica? Perhaps it could be the same visually but benefit internally from the advancements in technique developed over the last hundred years or so. Yusuke never likes to simply copy something; he always wants to try to improve it as well. One issue with a visual replication was that the tuning pegs - known as "patent pegs" - are no longer produced. To re-create their classic look was a tempting idea. To re-create the look with an improvement in technology was even more tempting. Yusuke recalled some repair work he had done in Japan on an old Martin OM guitar that had banjo planetary tuning pegs installed on it. Those two combined would make for an excellent ukulele tuning peg. 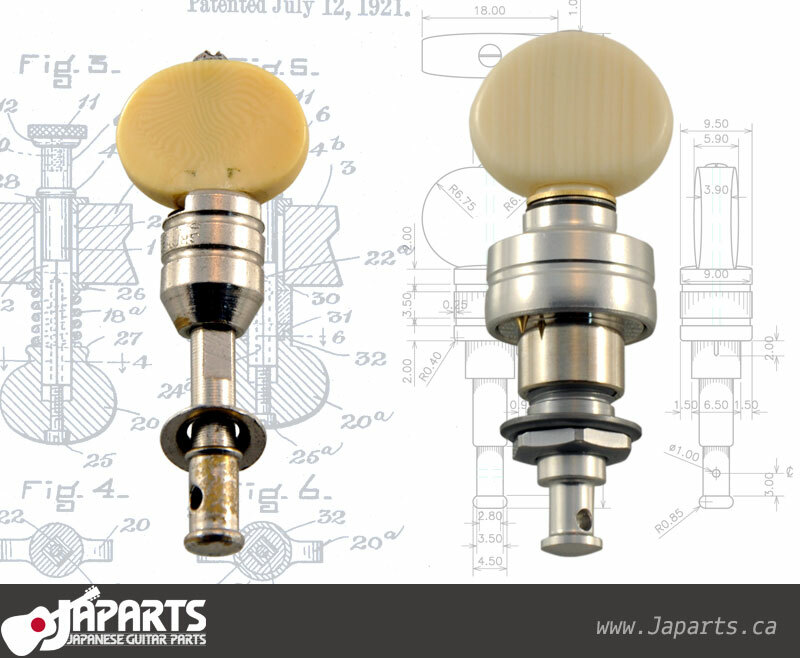 And so, with help from his friend Akira (skilled in CAD software), Yusuke designed a planetary gear tuning peg with a similar look to the patent pegs. (Yusuke took the time to look up the patent, which had expired long ago.) A message was sent to Gotoh through a friend with business ties: can this be made? The message came back: no. Patent pegs are very narrow; there's not enough space for a worthwhile planetary gear. The idea was shelved, but not abandoned. Yusuke planned to talk to other manufacturers the next time he went back to Japan. Maybe engineers from the auto or watch industries could build it. He could at least ask. 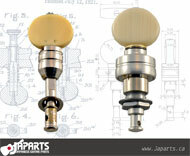 Meanwhile, Yusuke researched the design of banjo planetary pegs. He cut one open to see how it was put together. He saw that the outer shell was too thick. If its thickness were reduced the peg could be lighter and smaller. Ukulele players generally prefer small and light tuning pegs and the banjo pegs were definitely too large. There was also more research done just by continuing regular work. The opportunity to repair more vintage Martin ukuleles came up and he noticed that patent pegs were replaced with champion pegs - a larger, thicker, and heavier peg. This could be a decent compromise: a planetary-gear tuning peg similar in size to the champion pegs rather than patent pegs. New plans were drawn up and this time Yusuke was actually able to visit Gotoh to explain his vision. They were very receptive this time. While Yusuke had been refining his plan, Pegheds had arrived on the scene and were fast becoming popular. Gotoh hoped to move forward with a worthwhile competitor for the exploding ukulele market. And like Yusuke, they always hope to improve rather than simply replicate. When Yusuke first encountered Pegheds, he was envious of their idea and quite frankly annoyed that he had spent 15 years or so making ukuleles without having thought of it first! But after installing and removing some, they were inspirational in giving him ideas for doing things differently. 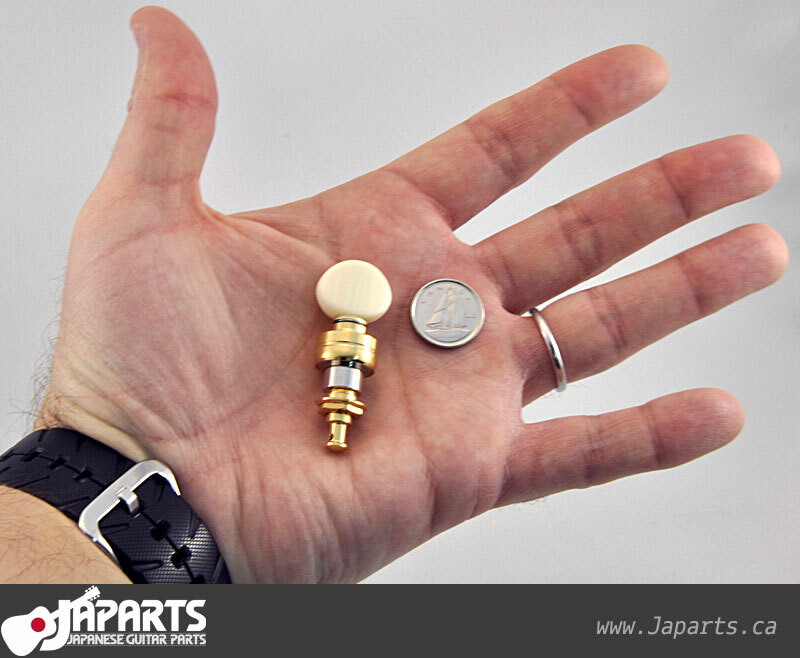 For one thing, he really wanted the Gotoh planetary tuning pegs to turn smoothly. Also, he wanted them to be easy to both install and - more importantly - remove. 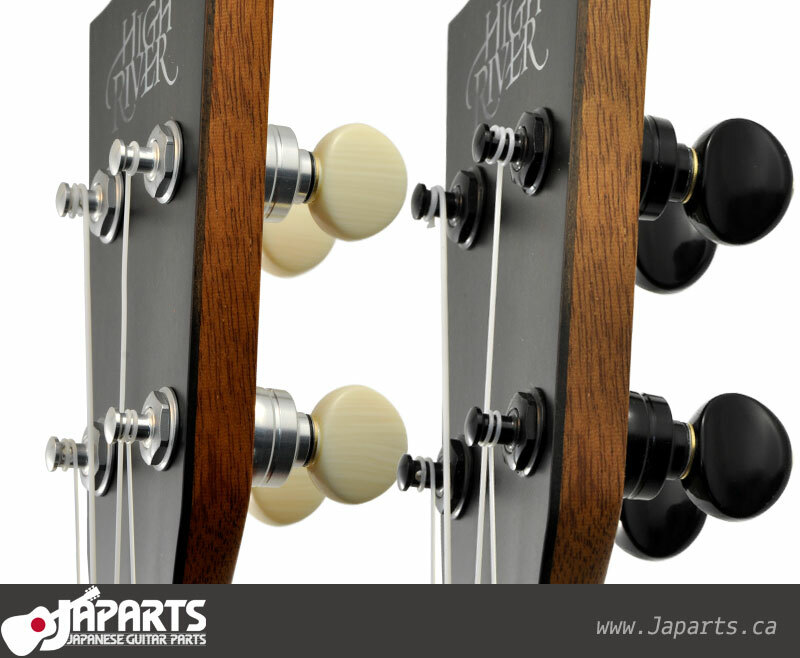 As someone who's done repair work, Yusuke knows quite well that a tuning peg that's difficult to remove is frustrating and it increases the chances of damaging the headstock. In essence: easy to put on, easy to use, easy to replace. Everything about it should be a pleasure since that's what ukulele is all about! 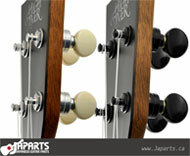 In late 2011 Gotoh sent the first prototype to Yusuke. He sent his recommendations back. Aesthetics were agreed upon and compromises were reached between Yusuke's desire for lightness and the Gotoh engineers' desire for structural stability. They were thinner and smaller than the banjo pegs, thanks to the use of aluminum. By late spring of 2012 the final round of prototypes were sent not only to Yusuke but also some major ukulele manufacturers for testing and feedback. The plan was to announce them at the Winter NAMM show in 2013 and start selling after that. Apparently, though, they were just too good! One Japanese ukulele maker (we won't say who, but it wasn't Yusuke) just had to express how much he loved them on his blog. Publicly. And since they were now unofficially announced, we were allowed to start selling them right away. We ordered some, took photos as quickly as we could, then put them out there for people to buy. It was far from the most coordinated sales campaign, but at least we got them to market! Yusuke is very proud to have been a part of this exciting product and we're very pleased to be able to help people get them. We've only heard good things from the people who have bought them from us. We're not surprised, since we use them ourselves and we know how great they are! By the way, Ralph eventually got his replica. It was a long wait, and for a long time Yusuke couldn't even tell him why he was waiting due to non-disclosure agreements, but in the end he's incredibly happy with both the ukulele and the amazing new tuning pegs that keep the strings tight and the songs flowing. As he likes to say, "keep strumming, smiling, picking and plonking!"